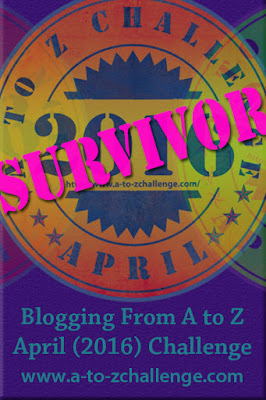 This will be the first year of entering this blog into the A-Z Challenge. It will also be the first year I am entering TWO blogs into the Challenge: GenWestUK has been a participant for four years previously. My theme for that blog will be Genealogy Trivia, which always seems to go down well and I get a lot of fun writing the posts (and learning some weird and wonderful stuff!). And the theme for this blog? Some may think it difficult, when it's a Surname Study about one surname - so all the days would have to begin with M is for Murch. So I am going to concentrate on given names, like A is for Aaron, B is for Beatrice, C is for Charlotte and so on. All members of the Murch One Name Study. Sounds like an interesting theme and go you, for entering with two blogs your very first time! Thanks for the encouragement! I think I am looking forward to writing in this blog more than anything!